Carolyn Inez Houston, known as Inez, peacefully left this earthly life on March 14, 2019. Inez was an amazing woman, known for her strength, determination, resilience, faithfulness, and love of God and family. She was born in Collin County, Texas, on September 6, 1912, the eighth of ten children of Sarah Inez Kealy Mayes and James Coke Mayes. When she was around twelve years old the family sold their farm in Collin County and moved to Austin where her father became a real estate agent. Inez recalled always loving to run as a child and to spend time outside enjoying nature and sunshine (she said that she ran everywhere she had to go in Austin instead of walking!). After graduating from Austin High School in 1929 she attended the University of Texas. In 1930 she married Ira Hansford Houston of Georgetown, a marriage that endured sixty-five years until Ira's passing in 1995. 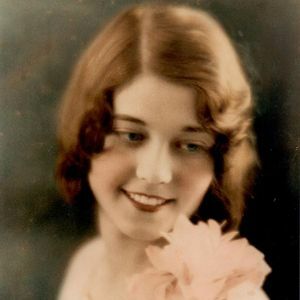 The story was that they met on a hayride and, whether that's true or not, her youngest sister, Jeanne, once commented that Ira was the "cutest thing she ever saw." And so he was! There can be no doubt that he was likewise attracted by Inez's loveliness and beauty. After their marriage, they made their home in Austin. Their first child (Ira Sam) was born in 1935 and second child (Daniel Edward) in 1938. In 1946, they moved to Round Rock and started a restaurant, Houston's Grill. Their third child, Sarah Virginia, was born while they lived in Round Rock. Eventually they returned to Austin and made their permanent home at 4110 Speedway in Hyde Park, a historic bungalow now known as the Bailey-Houston home. Inez worked successfully as a secretary and administrator in several locations, including the Steck Company and Slaughter's Grocers, but her real career for thirty-one years was with the United States Air Force as an administrator and personnel trainer at Bergstrom Air Force Base in Austin, which was for a time a Strategic Air Command site and a Tactical Air Command site. Although, after his retirement from the City of Austin, Ira achieved special recognition for his many hours of volunteer work at Brackenridge Hospital's emergency room, receiving the State of Texas Governor's Award for Outstanding Volunteer Service in 1982, Inez likewise engaged in significant volunteer work after her retirement from Bergstrom in 1984. Having moved to Dripping Springs in the mid-1980s she and Ira greatly enjoyed their friends at the Hill Country Senior Center and Inez gave generously of her time and energy at the Senior Citizens Thrift Store. She and Ira also gave much time and love to their family, helping with the care of her elder mother, who also lived to be a centenarian, and grandchild care (she was given the nickname "Nonnie" by her eldest grand daughter, Suzanne, and it stuck to the end). Inez enjoyed a very long retirement. She loved to paint with oils and acrylics, and especially enjoyed extensive xeriscaping and walking on her acres in Dripping Springs, which represented a return to her childhood love of nature and outdoor exercise. Her membership at the United Methodist Church of Dripping Springs and especially her loving friends and Sunday school teachers there were a joy and mainstay in her life. In 2009 she relocated to assisted living at Grace House, where in 2012 she received the Centenarian Certificate from the National Centenarian Awareness Project and continued to celebrate her birthdays all the way to 106. Grace House truly became her home and she found a place in the hearts of all the loving caregivers there. The Grace House staff, who called her "Nessie", always went well beyond the necessary and expected to give Inez an experience of security, love, and a stable, uplifting environment that is simply beyond compare. Thank you, Grace House! For the last three years, Guiding Hospice offered palliative nursing care, and social and spiritual support; they, too, offered an outstanding level of care and kindness, ensuring that Inez's final years, months, and days were comfortable, healthy, and blessed. As stated at the beginning, Inez was an amazing woman, strong and determined. In the end, her faith, love of family, professionalism, and noteworthy longevity distinguish her life as one of inspiration and goodness. In the last few years of life Inez confided that she prayed constantly for the good of the whole world, and so we were all blessed by her long life and the good will she had for all people in her heart. Inez is survived by children, Ret. Judge Sam Houston and wife, Helen, of Krum, Texas; Dan E. Houston, sculptor and former architect, of Winchester, Virginia; and Dr. Sarah Houston Green and husband, William, of Dripping Springs; grandchildren, Suzanne Gonzalez; Kathy King; Rachel Houston; Kari Houston Osborn; Melissa Houston, Ira Green, and Renata Green Neira, and numerous great grandchildren. We love you, Nonnie, and will miss you greatly! You were truly one of a kind; thank you for the love and care you always gave. Memorial contributions may be made to Dripping Springs United Methodist Church Building Fund (Capital Campaign Donations; PO Box 99, Dripping Springs, TX 78620), or to the Hill Country Senior Center of Dripping Springs (1310 Hwy 290 West, Dripping Springs, TX 78620). Memorial contributions to Dripping Springs United Methodist Church Building Fund (Capital Campaign Donations; PO Box 99, Dripping Springs, TX 78620), or to the Hill Country Senior Center of Dripping Springs (1310 Hwy 290 West, Dripping Springs, TX 78620.